Shuttle bus drives over mint-condition trolley tracks left over from the old Suffolk Downs Loop in East Boston. 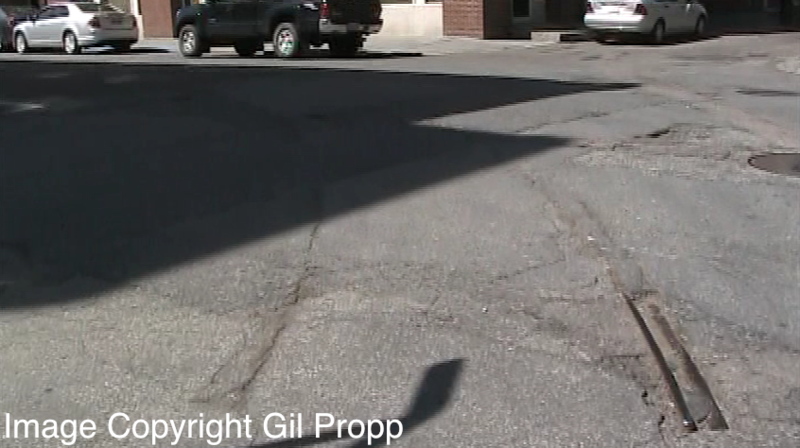 Ever wonder why there's a bar of metal sticking out of the pavement of a main street, or there's a lone pole standing on a street corner that just doesn't seem to fit with the surrounding streetscape? All of these anomalies you see are remnants of the multiple trolley lines that once ran all over Boston. 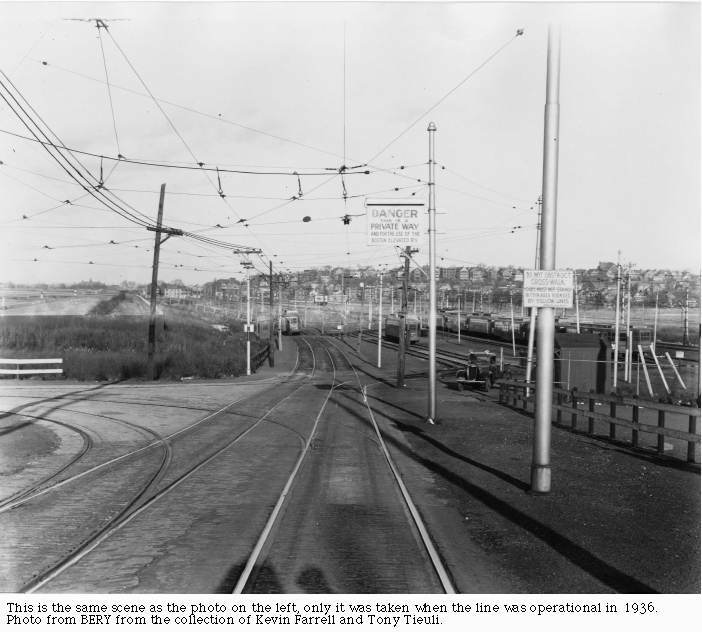 As I have discussed in Streetcar Tracks and in the "Green Line" article on this website, the four Green Line branches and Mattapan Line are the five main operational remnants of the extensive streetcar system Boston once boasted. Many more subtle remnants, many of which no longer serve much of a purpose, are scattered throughout the city. The easiest to spot, as well as most prevalent, are trolley poles. When trolley lines were dismantled, some of the poles that once supported their caternary wires (the overhead wires that supply electricity to trolley cars) were left in place. Most of the old poles that stand today were left behind because they served a purpose at the time, for instance to support a telephone pole or to carry municipal electrical wires. However, others remain because there was simply no need to take them down at the time and doing so would have been an unnecessary expense, particularly when the poles could later be repurposed. Fellsway trolley in 1955, note the cap on the pole on the left. Old trolley pole on Philbrick Road at Route 9 in Brookline holding up a telephone pole. While it looks like a trolley pole and is located next to the trolley line that once ran along Route 9, it has been shortened 12-15 feet as poles usually were when repurposed as such. Genuine poles are much taller (see Fellsway photo above for comparison). Decommissioned BERy trolley pole, with its cap still intact, significantly shortened and recycled as an electrical pole support and signpost along the Arborway in Jamaica Plain. BERy trolleys never ran along the Arborway, except between South and Washington Streets by Forest Hills Station, a sure indicator that this pole is a transplant. Old BERy pole on Winchester Street in Brookline. BERy trolleys never ran here; this pole was recycled to support a nearby telephone wire. In addition to consulting old BERy maps to determine whether a trolley ever ran nearby, a reliable way to tell whether or not a full-length pole you see on a sidewalk genuinely supported a trolley that ran there is to check the pole's rake, or its angle. A genuine pole will generally be angled away from the street, whereas a pole, such as the Newton one above, that is angled towards the street and away from the telephone pole it supports is most definitely a transplant. The pole has a BERy-type cap, retains its full length, sits along a former trolley route (Harvard-Dudley, now served by the 66 bus) and is fairly straight. Trolley service ended here in 1938, so this pole is a true survivor! It sits along BERy's old Route 9 trolley route now served by the 60 bus. This pole is angled away from Route 9 so it is very likely that this pole once supported the Route 9 trolley, which ended service in 1932. These two poles are directly across the street from each other along the present-day 60 bus route. 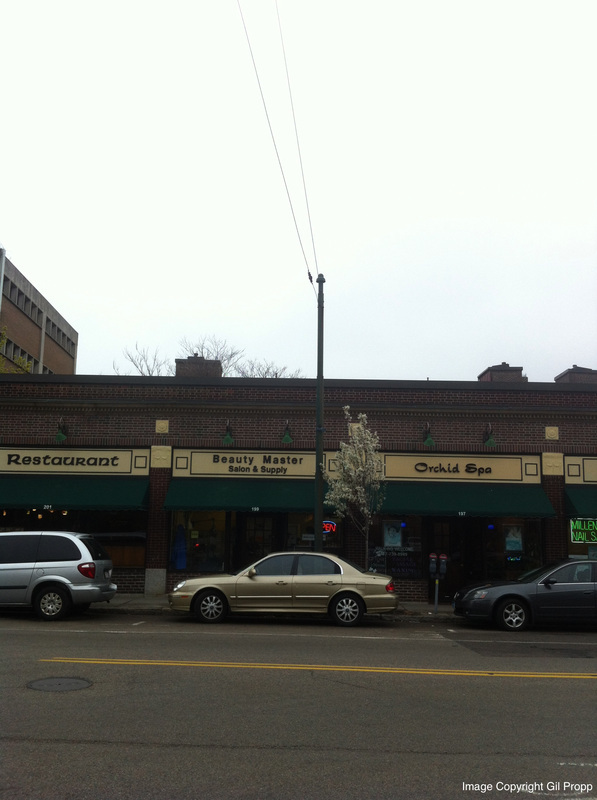 They are located right by Robinson Field, which used to be a BERy trolley barn! They are tall and are raked away from Cypress Street, which makes it extremely likely that these two poles are genuine remnants of the barn, which sat right where these pictures were taken on the corner of Cypress and Franklin Streets and was demolished in 1934. 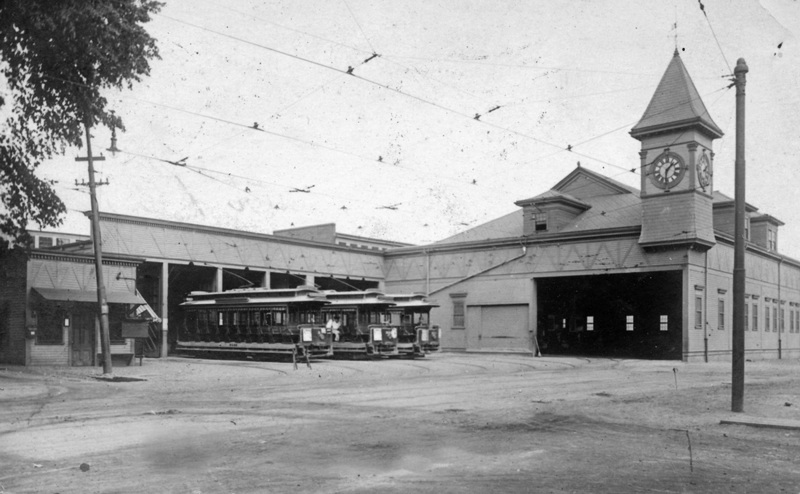 The old trolley barn at the corner of Cypress and Franklin Streets in Brookline, where Robinson Field is today. The pole on the right of the photo stands right where the second pictured pole (the one with the bus sign on it) stands today, providing further evidence that these two poles may very well be genuine remnants of the trolley barn! 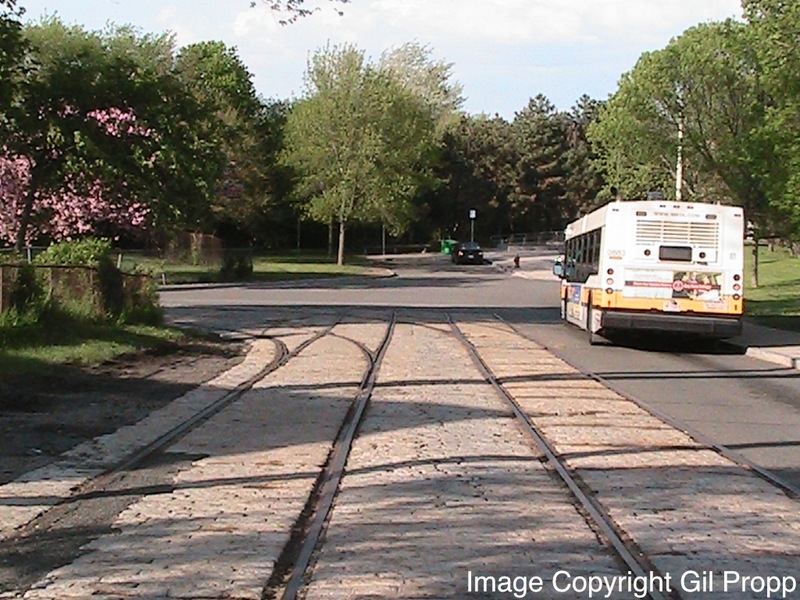 More genuine trolley poles can be found along old trolley routes, particularly along the old A Line route and along the section of the E Line between Heath Street and Arborway that has been closed to revenue streetcars since 1985. Genuine A Line trolley pole on Brighton Avenue in Union Square in Allston raked away from the street and supporting a sign for today's 57 bus that serves the old A Line route. Genuine Arborway Line trolley poles along Centre Street in Jamaica Plain. There are also a good number of genuine poles along the 87, 88 and 89 bus routes, all formerly trolley routes, in Somerville. 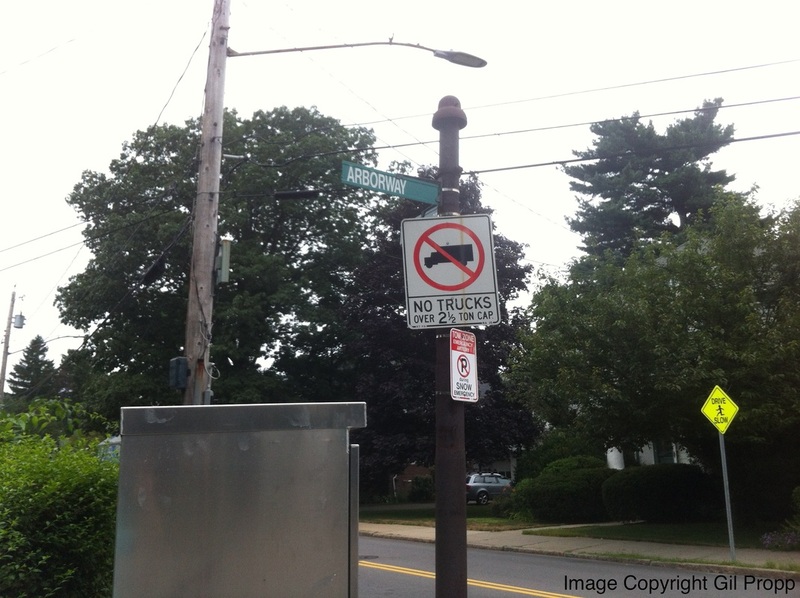 Many of these Somerville poles still have cut trolley wire hanging from their tops! Broadway at Watson Street in Somerville. Zoom in to the top of the pole, at the ring just under the intact BERy cap, to see a good amount of genuine trolley wire that once powered Somerville's 87, 88 and 89 streetcars and trackless trolleys! Another relic of past trolley service that is evident throughout Boston is decommissioned trolley tracks. It is much easier to tell whether tracks are genuine than poles; if there are old tracks in place and an old BERy map shows a trolley ran when the tracks are, then it is almost guaranteed that the tracks once carried revenue streetcars. These tracks never carried revenue streetcars. They were put in place in the late 1980s upon the opening of the new Forest Hills Station to be used by the Arborway branch of the E Line, then still slated for restoration, but the Arborway branch was never restored and the 39 bus has been the only regular service over the tracks from their construction to this day. Watertown Yard. Note the overhead wires—Watertown Yard served as a test facility for the dual-mode Diesel-Electric Trackless Trolleys that run on the Silver Line through the South Boston Transit Way when they were first delivered in 2004. Along the Commonwealth Avenue median by Boston University, where the A Line once ran and the B Line continues to run today, there is another track remnant with a particularly interesting background. As you may know, the Atlanta Braves were once the Boston Braves. During their time in Boston, the Braves played at a stadium called Braves Field, located where BU's Nickerson Field is today. Braves Field had a special streetcar track diverging from the Commonwealth Avenue Median, where the Boston Elevated Railway and later the MTA would schedule special streetcars to shuttle game-goers to and from (more on this at my B Branch article). 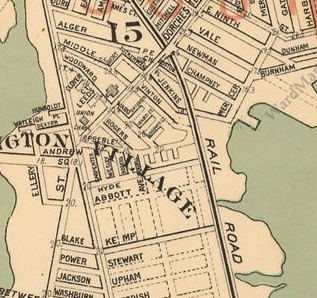 Remnants of Suffolk Downs and Gladstone Loops in East Boston, as well as of the streetcar right-of-way, officially known as Washburn Avenue, that once continued through the trees up ahead to Revere Beach. Image copyright Me (Gil Propp). Same tracks in the 1980s. The former streetcar right-of-way to Revere Beach is much less overgrown, and the tracks still continue into the marshland. 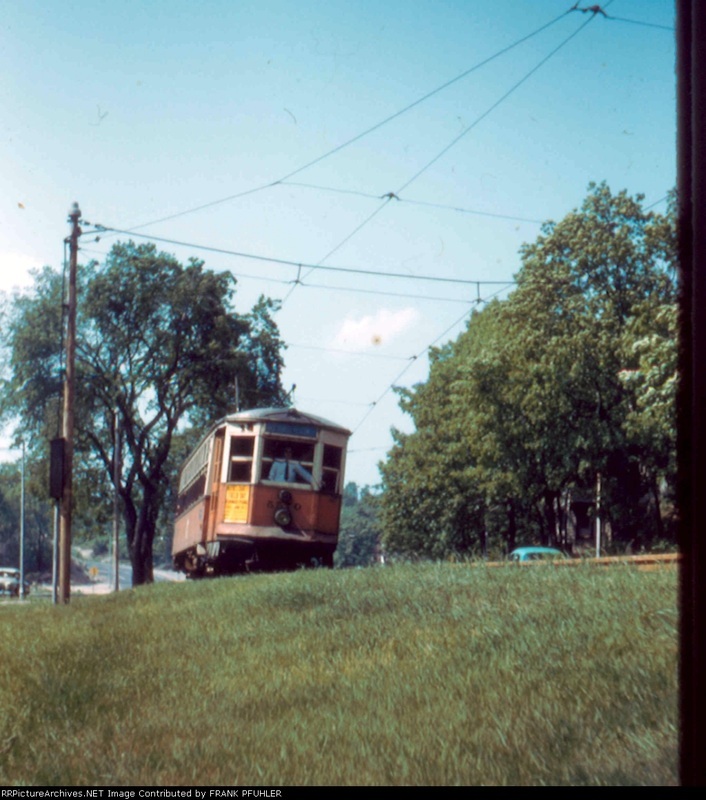 Many trolley poles appear to remain on the right from Gladstone Loop, to be shown below. Image copyright Tony Tieuli. These tracks, still enclosed in original cobblestone characteristic of original Boston streetcar tracks, were part of sophisticated streetcar operations that once took place in the above location. To the left was Suffolk Downs Loop, used for special events at the Suffolk Downs racetrack, and to the right was Gladstone Loop, used to park and turn around streetcars in revenue service. Up ahead was a streetcar median used by the 118 streetcar that continued through the overgrowth and continued to Revere Beach, a classic Boston center of entertainment in whose development trolleys played a significant part (see "Streetcar Suburbs" of Boston). Same tracks in 1936. 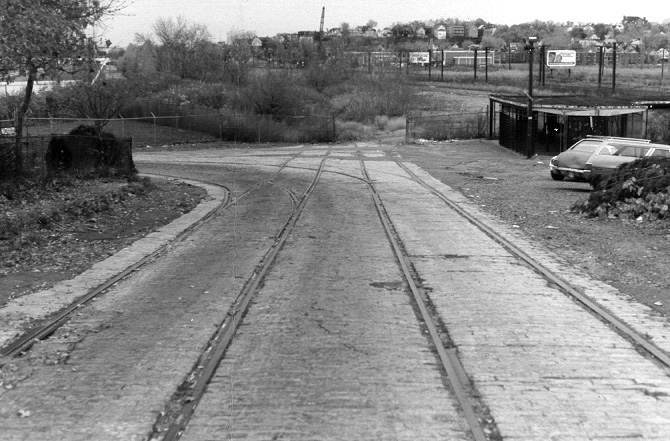 At left are the tracks continuing to Suffolk Downs Loop, at right is Gladstone Loop and the trolley poles that appear to have remained in place up until at least the 1980s. Up ahead is the old Washburn Avenue streetcar median and what appears to be a 118 streetcar headed back from Revere Beach to Maverick Square. No streetcar line ever ran on Alger Street. 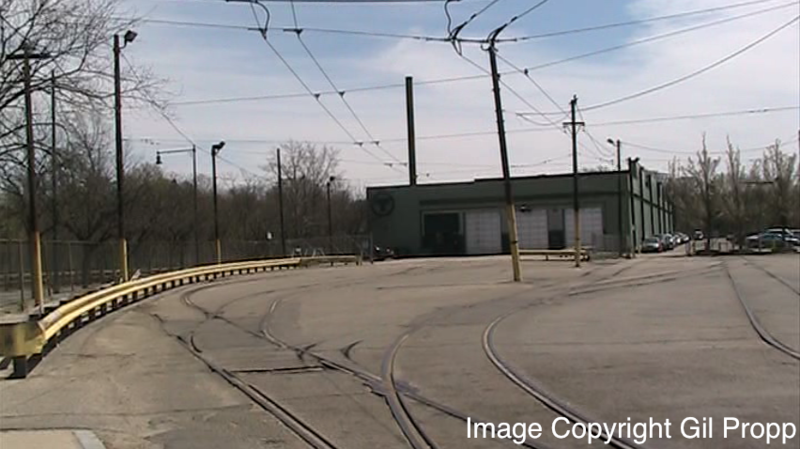 These tracks are a rare example of street-running freight train operations; they are most likely a freight connection between the Old Colony Railroad right-of-way, since converted to Old Colony Avenue, the industrial area the tracks can be found in today and the rail yards at South Bay. 1891 map showing Old Colony Railroad running along what is now Old Colony Avenue. Map courtesy Ward Maps. Note the amount of landfill that has been applied around Old Colony and Dorchester Avenues since the Old Colony Railroad ended service. In many cases, as I say in Streetcar Tracks, "tracks were simply paved over and exist today as a time capsule in the street." 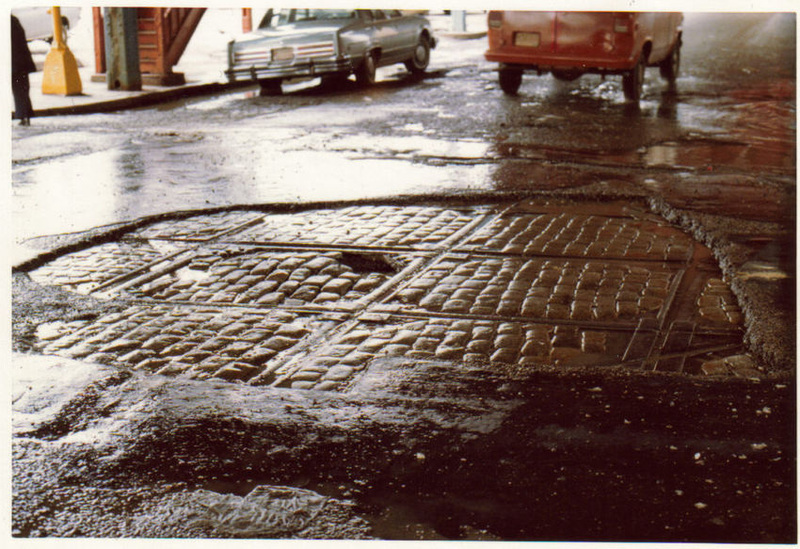 Tracks under the worn pavement on Washington Street in the South End in 1978. Note the Washington Street Elevated supports; this photograph was taken right under Dover Station at the intersection of Washington Street and what is now East Berkeley Street but then was Dover Street. Also note the cobblestone surrounding the tracks. Image copyright Paul Joyce. When roads are resurfaced, old tracks often show up underneath. 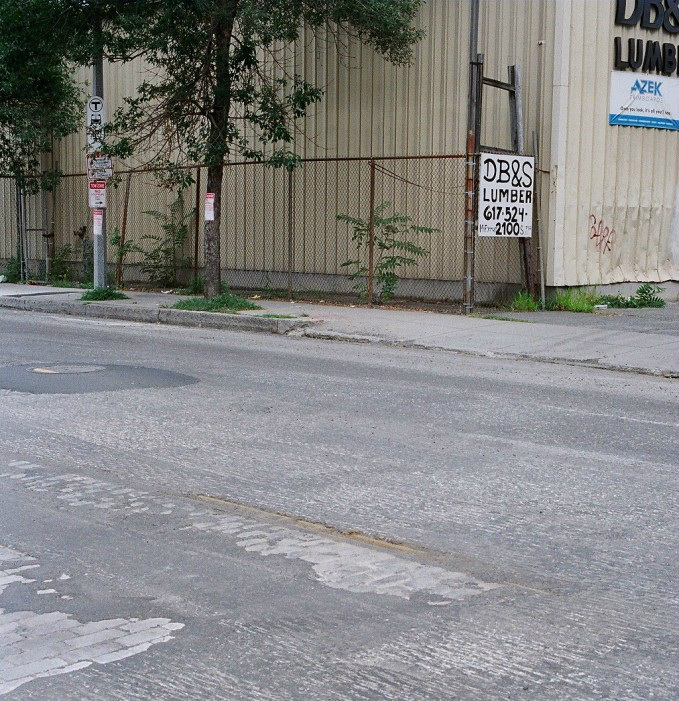 The above photograph, taken when Washington Street in Roslindale was resurfaced near Forest Hills Station, shows old streetcar rail, as well as old pavement cobbles, poking through the asphalt. Image copyright railroad.net user 3rdrail. On roads that have not been resurfaced for a while and once hosted trolleys, tracks begin to poke through as the asphalt cracks. Here on Blue Hill Avenue in Mattapan by Mattapan Square, tracks from the old 29/Mattapan-Egleston streetcar are beginning to poke through. Image copyright Google Maps. 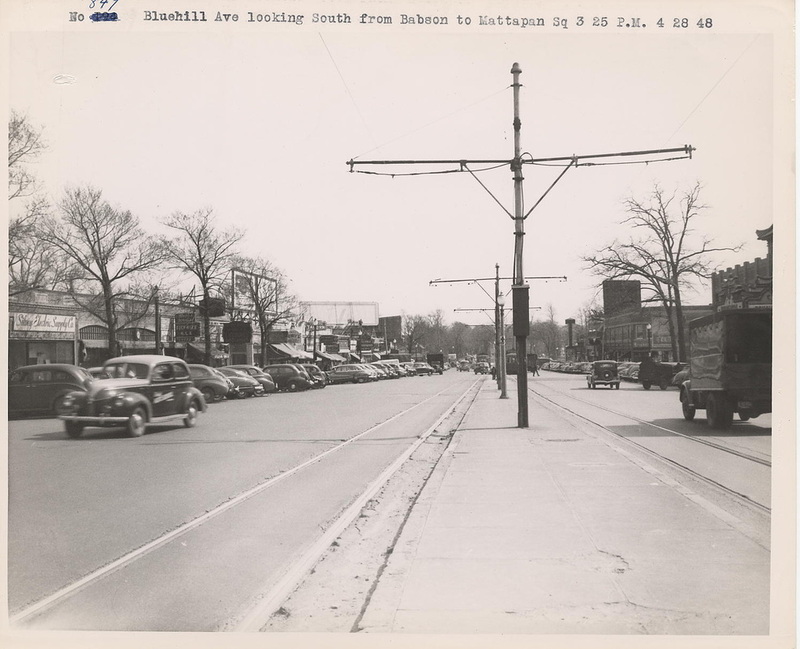 Same location in Mattapan Square in 1948. 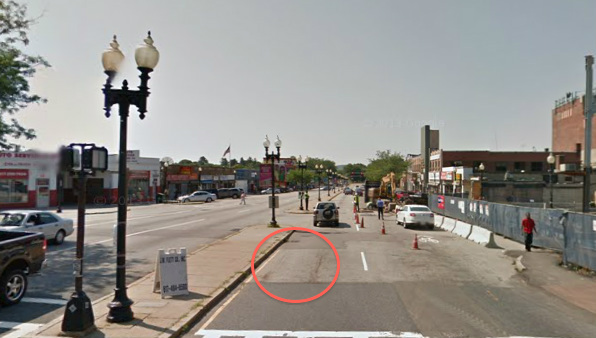 As you can see, right where the pavement is giving way in the previous photograph, there were once streetcar tracks. Image courtesy City of Boston Archives. Tracks poking through Alford Street at Sullivan Square in Charlestown. Sullivan Square was once the site of a significant El station where multiple streetcar lines, including the noble Fellsway Line, stopped as well. Old concrete El supports are visible in the left foreground of this photograph. Image courtesy Wikimedia User Pi.1415926535. 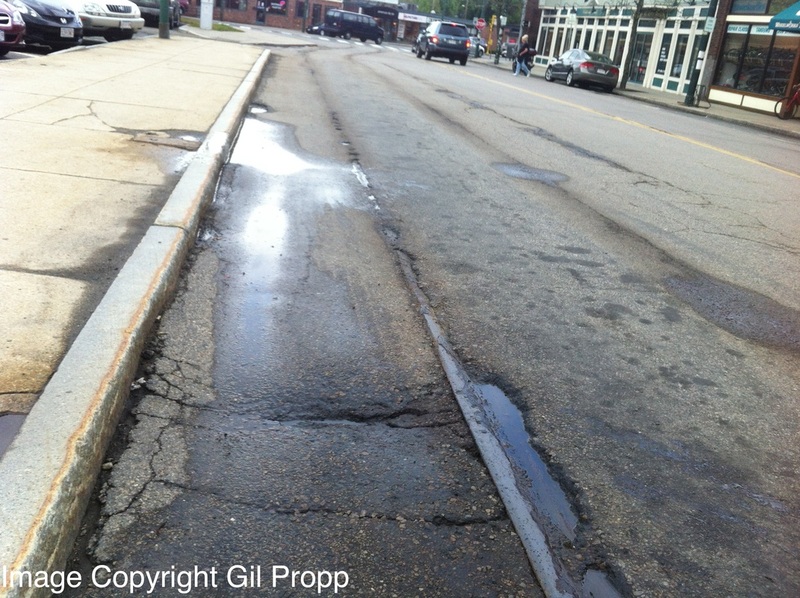 What is perhaps the most prevalent under-pavement track remnant in Boston is located in Waverley Square in Belmont, where the tracks from the 73/Waverley-Harvard streetcar poke almost completely through the asphalt. 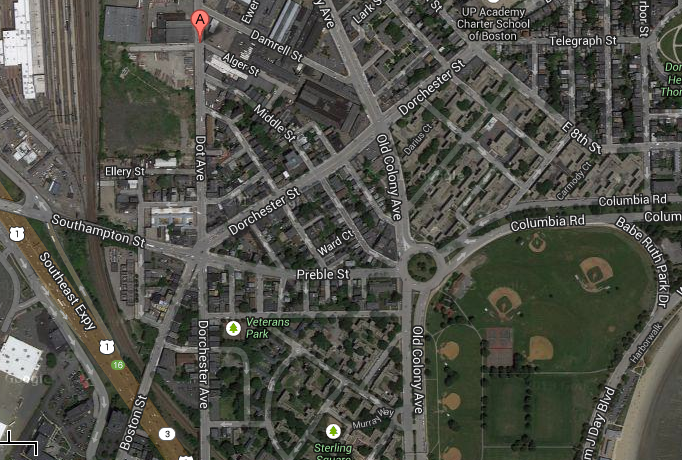 Scroll to the very top of the page to see the track remnant of the Suffolk Downs Loop in East Boston. These tracks were spared being paved over and are in mint condition, almost exactly as they were when they carried streetcars! Wherever a streetcar once ran, there is a high probability that its tracks were simply paved over when it was converted to buses or trackless trolleys. When a main road is being resurfaced or beginning to show signs of wear, look closely and you may very well see track remnants!